So, after a few months away from the studio, I'm back in business! I'm happy to say I'm open for all print and calligraphy inquiries! After a couple months away from Four Hats, I had a bit of time to reflect on some things—both life and business-related. Since I began in 2009, I hadn't really taken an extended break, so it ended up being a bit of a sabbatical, lending some perspective on the word I'd been doing and what I hope to do in the future. The following are just a few of the insights I gleaned. There is really nothing like getting through two items on a long to-do list to put a usually highly productive person in her place. There have been recent days during which I have accomplished little more than feeding my daughter, taking a shower, and putting on clothes. If I get around to unload the dishwasher, I feel like a superhero. For someone who used to run a million miles an hour and tends to finds my worth in how much I can get done, this has been a big shift. I can't do it all, but what I do take on, I can do more slowly, and hopefully... well. As it relates to business, I hope that the select jobs that I take on will get my more slow and careful attention as well. I won't be able to do as much, but I intend to devote myself intentionally and thoughtfully towards the work I do. 2. It's okay to spend selectively. Entering into parenthood has thrust me into a new and overwhelming realm of materialism. Clicking through blogs and scrolling Instagram for five minutes can leave a new mother feeling like she has to HAVE IT ALL. The most expertly designed Montessori toys, the expensive play mat, the books for stimulating eye development, la la la. After a few weeks of being a mom, it was like every cool clothing company and wooden toy maker knew just where to find me with their targeted ads. And, let me tell you, I'm such a sucker! When I see a little girl in a gingham dress and hairbow playing on a leather mat with her set of handmade blocks, I want those things. And, I simultaneously recognize that I don't need those things, nor do I want to constantly want things. This to say, I have really had to reign in desires for THINGS in this season. We don't need everything, we just need a few quality things. This has been a good reminder to me be wise in how I evaluate what is worth it and what will last. 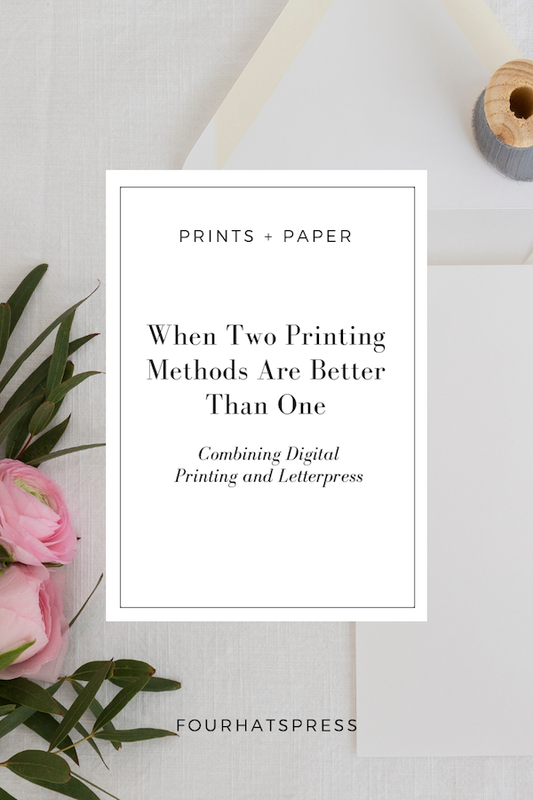 This is something I encourage clients to consider when making decisions about celebratory paper pieces, so it's been good for me to adopt as well. As I mentioned, time is at a premium these days, and I'm learning how to be more and more efficient with disposable minutes and hours I have. That said, as a task-oriented do-er, it's sort of in my nature to prioritize getting things done over and above investing in flesh-and-blood relationships. I recognize this about myself, and pray that in this season, I will learn to put aside my computer and phone, to be in the moment with the people in my life. Sometimes, this will mean I'll be a bit slower at accomplishing the items on my list. This will take some getting used to, but I know it'll be more than worth it. In the first few weeks of my daughter's life, we had two separate photographers out to our home to record some of the precious moments in the life of our family. Christina Hope captured some timeless stills in some of the earliest days of some of our baby girl's life. Jennifer then came to record some of the more real, everyday life and times of our new routines. 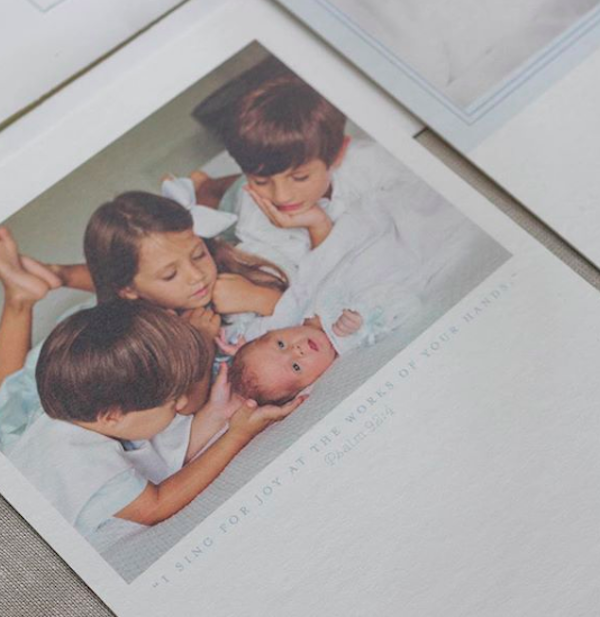 The images that they each captured are precious to us, and we will treasure them forever, share them with our families, pass them onto our daughter, and remember how we feel right now. In getting these photos done, I was reminded anew just how important it is to support creative work like this because it has the ability to preserve some of the most important moments in people's lives. And these are what will endure when many other things pass away. If you've been following me on social media, you know that my husband and I welcomed our daughter Evie in mid-June. I've been on maternity leave since then, enjoying her immensely as we've made the transition to life as three. It's been a sweet season, and I'm so grateful to have had some slower days to take it all in. As you know, I've always been an advocate for creating paper pieces to commemorate such seasons in the lives of my clients. But now I know the importance of preserving these moments first hand! 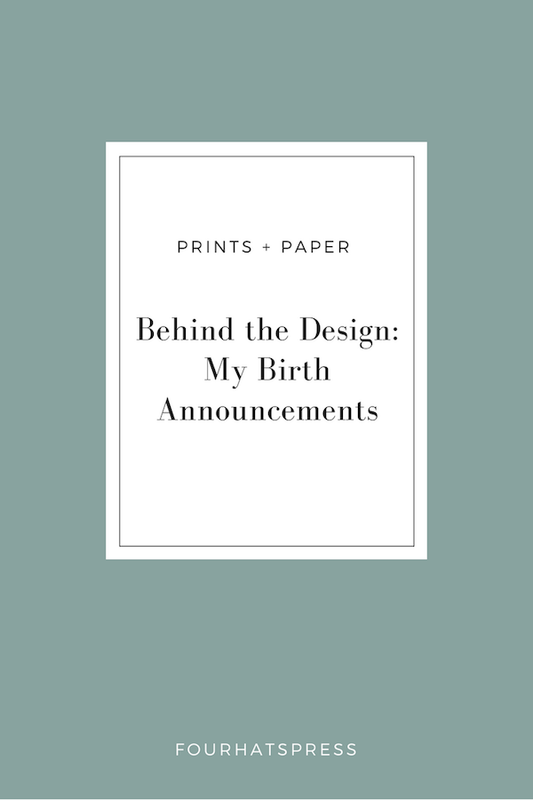 As a paper person with an affinity for creating custom birth announcements, I knew the pressure was on when it came time to design and print my own. That said, I had no idea what to anticipate when it came to how much time and energy I'd have to devote to the job once my little girl came onto the scene. I knew I wanted to do something semi-custom to celebrate her arrival, but I also wanted to be gracious with myself as I made the adjustment to motherhood. And, I wasn't altogether sure I'd be up for (or able) to get into the studio to do the printing myself. For that reason, I ended up going with a design that could be adapted digitally. Soon after Evie was born, I reached out to my friend and fellow letterer, Allie Hasson for some help. I absolutely love everything Allie touches, and I knew I wanted her hand on Evie's announcement for the watercolor lettering of her name. 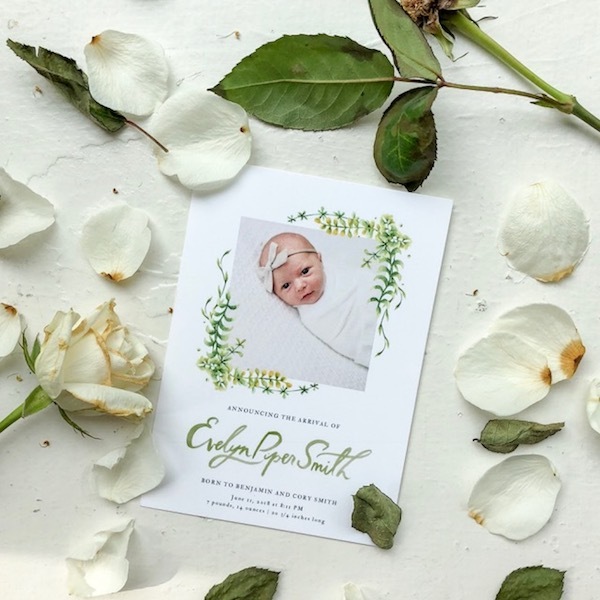 The precious photo was taken by Cristina Hope photography during a sweet newborn session just two weeks after she was born, and I love how it captures her sweet little smile. 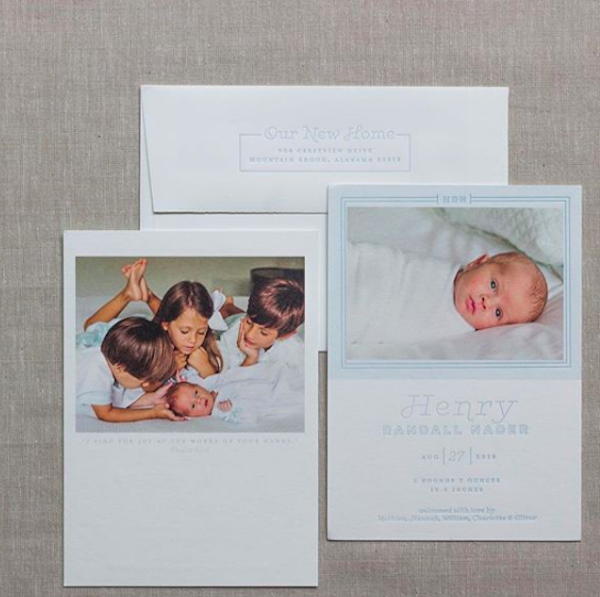 This woman has an uncanny ability to document some pretty precious moments. These words held particular significance for us in a season of grief and waiting on the Lord. While I was going through my second miscarriage back in October of 2016, we attended a concert by one of our favorite musicians, Andrew Peterson. As he sang the words to the Sower's Song, tears streamed down my face from the sadness of our loss and the hope it simultaneously planted deep within my soul for the life and resurrection to come. I've never experienced such visceral desire for the new earth. While I'd never wished for the hurt I felt at the loss of life, I'm so thankful for the way the Lord used it to harvest hope. Where there was death, he brought life. Even now, we see redemption in our little girl, and we praise his name for the glimpse of kingdom come. With Baby Smith set to arrive in just a few weeks, I’m in full-fledged nursery-decorating mode over here. Once we got the dresser painted and polished up with new brass knobs, the rocking chair and ottoman, and crib (almost) squared away, I have been preoccupied with the little touches that are going to make this room (that I’ll be spending a lot of time in) feel complete. We don’t know whether we’re having a boy or a girl, so I wanted to pick pretty neutral things for the nursery that could grow and change as he or she does. Here are a few of the staples and some prints and accessories I’ve got my eye on for the space.